Please email videos, photographs and news tips to [email protected]. As pictures, videos and reports continue to flow in to ANP from our readers of military convoys across America as shared more below, according to the Palantir Blog, there are now more than 21 million American Veterans across the country; men and women who have served America in uniform in wars including WW2, the Gulf wars, Vietnam and Korea. 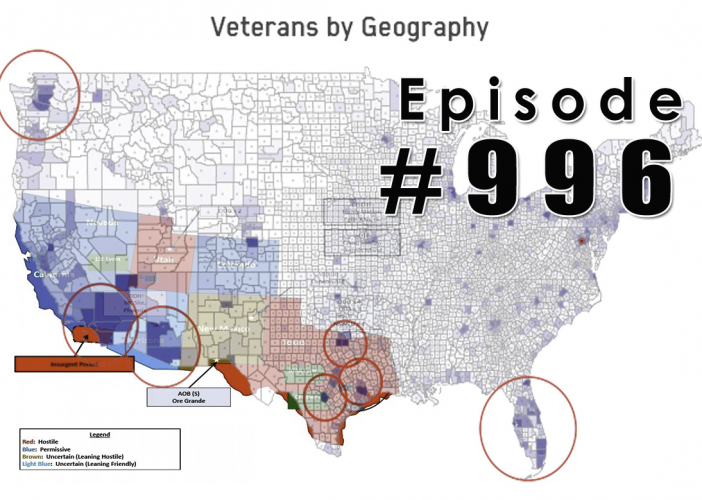 According to the 1st map above left taken from the Palantir Blog, those US Vets are now living largely in 'sun belt' areas of the US including Southern California, Nevada, Arizona, Texas and Florida. 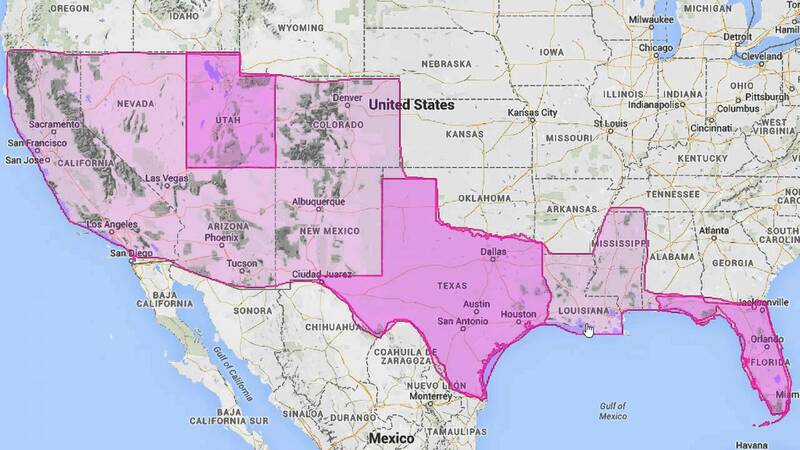 Coincidentally, or not, many of those same states are now being targeted by Jade Helm 15 as seen in the map on top right showing states that have been linked to JH15 and, as radio show host Pete Santilli shares with us in the 1st and 2nd videos below, two Bilderberg attendees' 'Veterans Database' from Palantir matches the 'Jade Helm' map as seen directly below, superimposed over 'Veterans by Geography' map, almost perfectly. 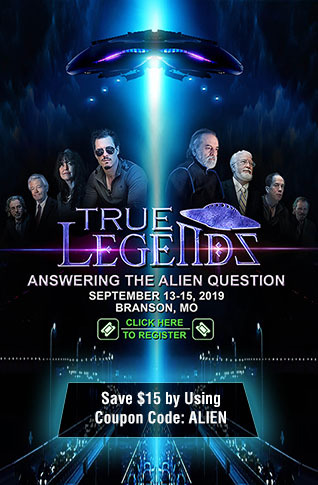 Beginning at the 2:45 mark of the 1st video, Santilli asks that this information be spread far and wide, especially amongst US Veterans, as we learn that two attendees of Bilderberg, Peter Thiel and Alex Karp, have created the database on US Veterans at Palantir that has so infuriates Santilli as he tells us in the video below. 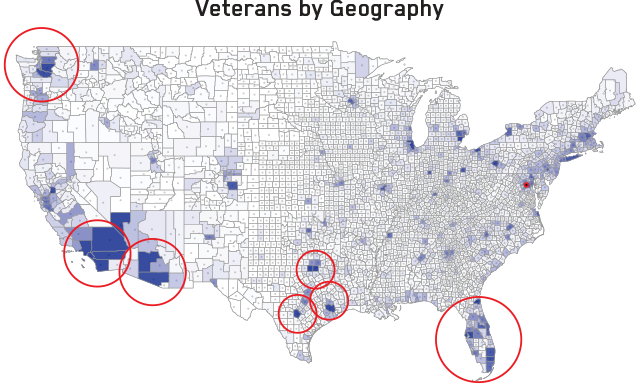 Why would Thiel's database targeting US Veterans match up nearly perfectly with Jade Helm 15's geography? Is this more proof US Vets are being targeted? With all of this happening, All News Pipeline has also been sent a large number of pictures from our readers as seen at the bottom of the story showing military movements still happening across America. While reporting yesterday on what we believe to be a United Nations chopper convoy over the state of Washington, we were also emailed a picture of a Chinook helicopter convoy over Utah by another reader who shares with us that he's seen these convoys for years but never in the HUGE numbers that he has been seeing lately. We've also received pictures of part of a 20 to 25 vehicle military convoy heading south on I-81 in Virginia as well as more pictures of Saudi 'Civil Defense' vehicles being hauled in Texas. In the 1st two videos, the 2nd video is the entire Pete Santilli program while the 1st video specifically outtakes the US Veterans being targetted beginning at 2:45. In the 3rd video below, Alex Jones talks about the 'point of no return' and with all of the preparation by the military we are witnessing across America, something huge is likely coming this summer. 'We are going over the edge right now...the event horizon...the point where there is no turning back...the point of no return'. These images were sent to us by an ANP reader in Texas who originally saw them back in February of 2015. Why are these Saudi Civil Defense vehicles being seen in Texas, now twice by two different ANP readers? These vehicles were part of a 20 to 25 military vehicle convoy moving south on I-81 in Virginia sent to us by an ANP reader.